Benjamin has been hard at work reviewing the Herodrive collection in time for Christmas season. As a huge DC fan, he’s had a lot of fun with these amazing vehicles from Funrise. Each vehicle is equipped with its own unique feature and combines all their favourite DC characters. 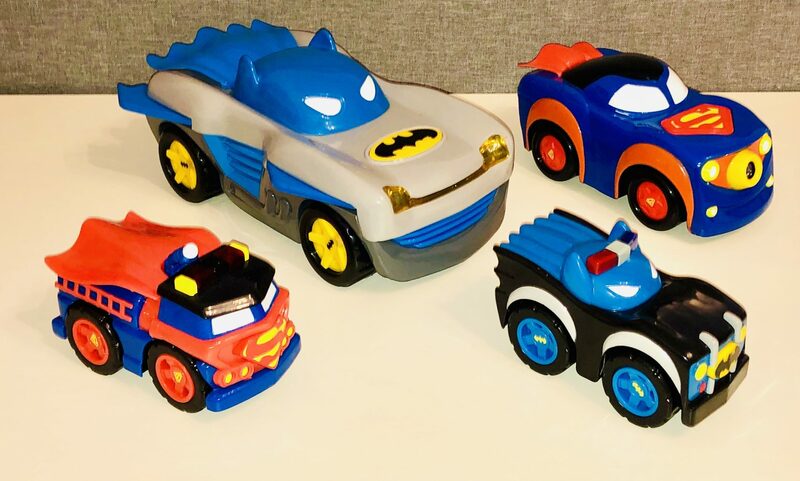 To make sure there’s something for everyone, you can choose from the Herodrive Bat Racer, Herodrive Signal Squad or the Herodrive Mash Machines. Benjamin has loved them all but I think the firm favourite is the Herodrive Bat Racer. 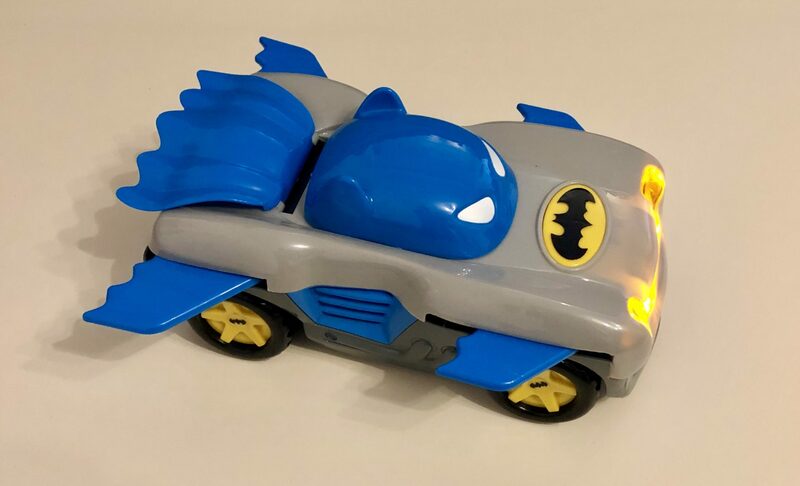 It’s the ultimate Batman Racer with working lights, engine sounds effects and it even self-propels along by the push of a button. This particular car has two modes: regular or you can slide the windshield forwards to make the wings shoot out and enter race mode. The car itself is brilliant and chunky – it’s a lot bigger than I first thought which is great for small hands to really get a hold of. Benjamin loves the lights and sounds and loves how it moves by itself (even if it does need a gentle nudge on our carpet!). The moving cape at the rear of the car adds a little more fun to the vehicle as it races away. The colours, although not your traditional bat mobile colouring is bright and engaging for small children. 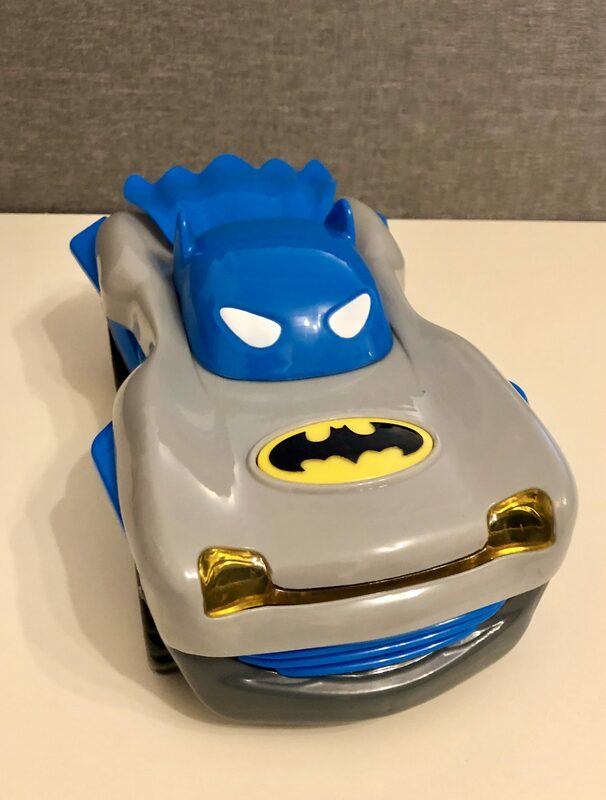 The batman logo is clearly displayed on the bonnet of the car and this logo acts as the button to activate the sound, light and movement of the car. It alternates between a Batman theme type music & light and then movement with a revving engine. 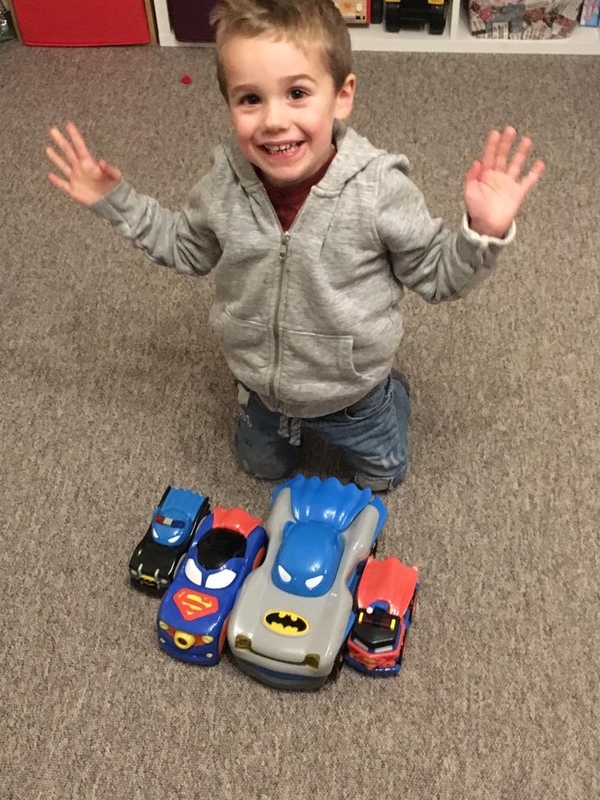 The two modes keeps Benjamin entertained for hours and he’s had so much fun with the Bat Racer: he thinks it should definitely be top of every young DC fan’s Christmas list. The Bat Racer comes with batteries included so you won’t be rushing around Christmas morning to find some! You can buy the Bat Racer from Amazon for £24.99 and Hamleys and will be available in ASDA from February too. Herodrive Signal Squad cars are a wonderful mid sized car with plenty of fun just without and of the noise. 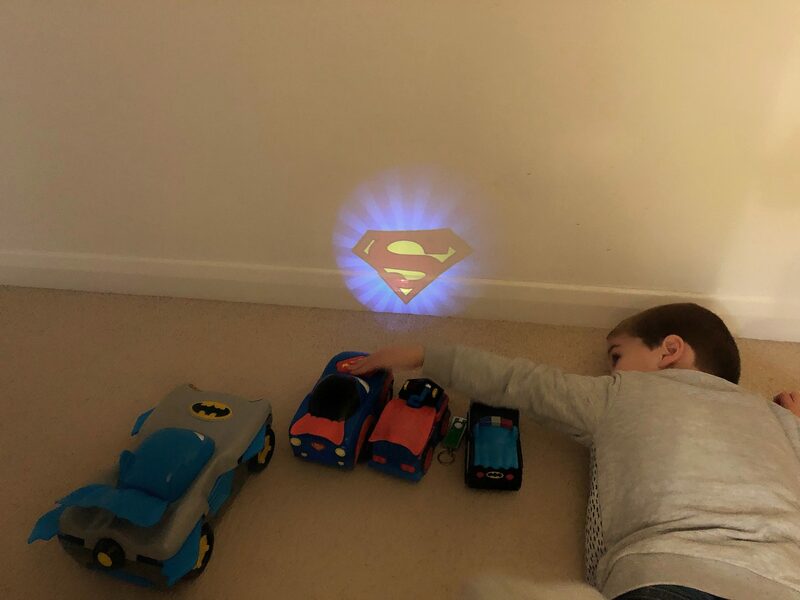 Benjamin loves his Superman Signal Squad car and plays with it like a regular car during the day but takes it to bed with him as a torch at night. He loves to project the Superman logo onto the ceiling and make up stories before bed. 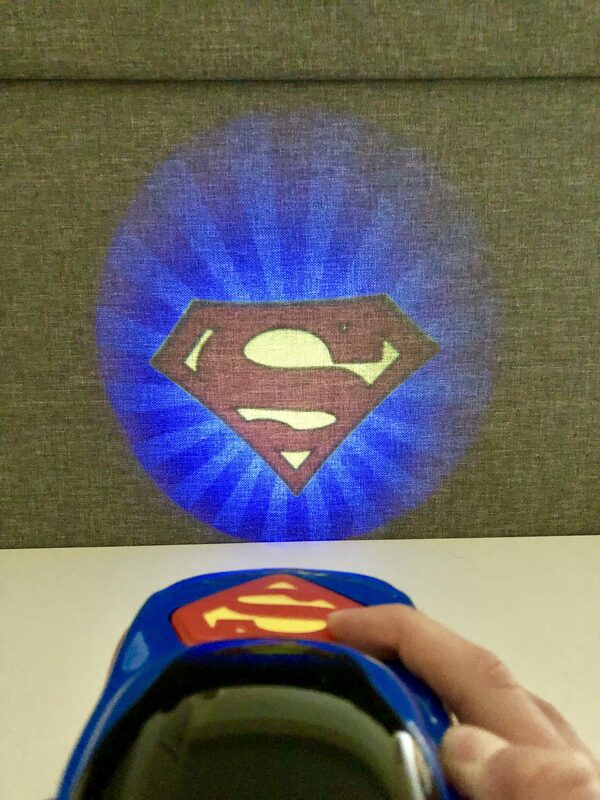 Although there isn’t any accompanying sound with this model, the torch projection element is just as fun and engaging. I will often go out of the room to start the dinner in the evening and walk back into darkness as the children are playing with the Signal Squad car and other vehicles. The car is durable and light, just like the Bat Racer. Each Signal Squad vehicle is robust and well designed for smaller hands. They will withstand a bash or two as they inevitably crash while racing to save the day. Available from Amazon at £12.99, these quiet cars will be high up on the list for Christmas gifts that parents will love too. Again, batteries are included in the toy already which is a real bonus on Christmas Day. Finally we have the Herodrive Mash Machines; these are a mash up of your favourite DC characters and urban vehicles. They come fully equipped with flashing lights and character appropriate sound effects, you simply need to push the character symbol to activate the sounds. Bring your baddies to a halt with the character appropriate sounds or go screeching round the town to ensure you capture your crook in the action. These Mash Machines are the smallest of the range but they are great for racing round the front room and colliding with the bad guys. 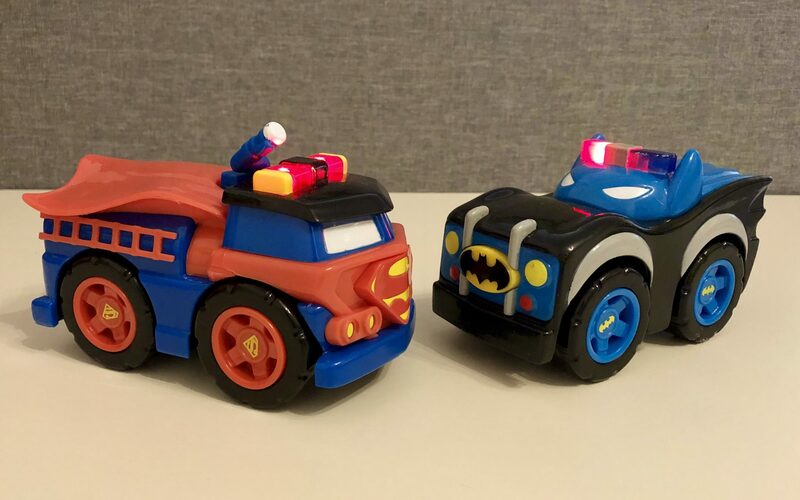 The attention to detailing on all the cars is great, with logos on the hub caps and capes on the back of each car they are the perfect hero cars for small people. The Mash Machines can be bought from Amazon for £7.99. 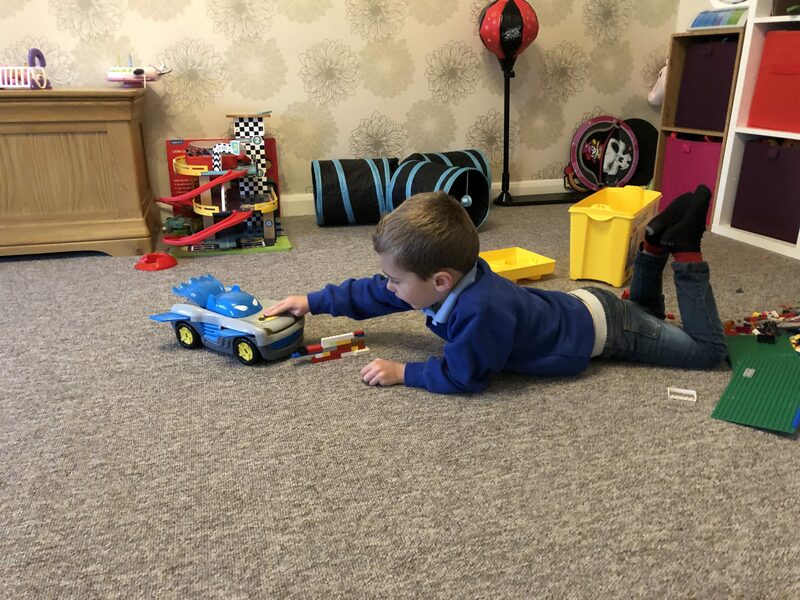 Benjamin will often come in from nursery or pre-school and before he does anything else, he will start playing with the Herodrive range. He incorporates other toys into his play, usually construction type toys that he can use to bash down and crash through. Although not suitable for children under 3 years of age, these are great fun and really encourage imaginative play. Benjamin at 3 and Isabella at 6 have plenty of fun playing together with the whole range.